Guest Post by Genevieve Larkin, Assistant Librarian at Marino Institute of Education Her professional interests include information literacy & continuing professional development for librarians and educators. 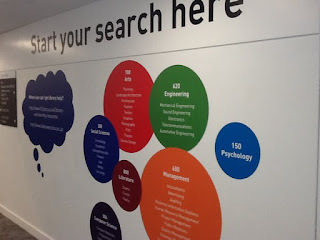 Measuring the outcomes of information literacy education has become increasingly important for academic and research libraries as they seek to assert the value of their contributions to graduate outcomes and employability, research output and communities of practice at their institutions. 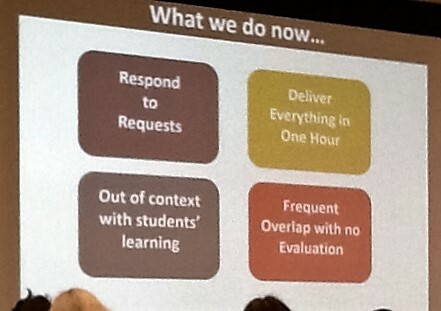 Bodies such as the ACRL have produced reports providing evidence that "collaborative instructional activities and services between the library and other campus units (e.g., writing centres, study skills and tutoring services) promote student learning and success" in measurable ways such as improved grades and student retention. 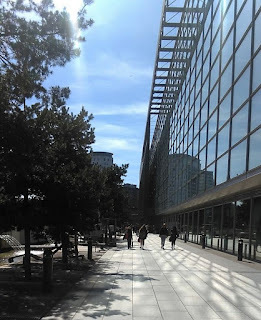 But according to Research Libraries UK, “the paradox may be that that the more library services are integrated with academic activity the more difficult it will become to determine a direct relationship.” Many librarians continue to seek examples of best practice in this complex area. On the 4th May Birmingham City University hosted a timely and engaging conference called Measuring value: the impact of information literacy and its evaluation (known on Twitter as #BCULIBCONF which showcased some practical and inspiring ways for academic librarians to grapple with measuring the impact of the academic library on student learning. 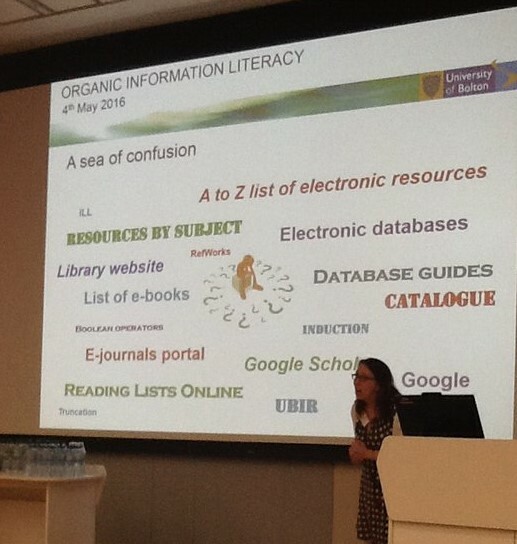 With its three overarching themes of student progression, supporting research students, and enhancing employability, the conference provided ample scope for reflecting on the difference that innovative practice in information literacy instruction can make within our organisations and how we can capture evidence of such. The conference was held in the colourful and interesting Curzon Building - a new state-of-the-art addition to the BCU City Centre Campus. The 24,300m² Curzon Building is home to a student support hub as well as a new library, teaching and IT space, plus other student-facing facilities. There were three keynote presentations which demonstrated exciting approaches taken at Edinburgh Napier University, NUI Maynooth, and the University of Bolton, as well as multiple parallel sessions offered in the morning and afternoon which forced delegates to choose between several interesting looking presentations. The morning began with Keith Walker (business librarian) and Stephen Robertson (lecturer at Edinburgh Napier Business) describing how they had collaboratively mapped digital literacy to assessment criteria and embedded bespoke library resources to module assessment guidelines within Moodle. Doing so allowed them to measure online engagement with these materials and assess correlation with improved grades. I was equally inspired by Maria Mawson from the University of Sheffield’s talk Demonstrating the value of information literacy for employability which described how the Library sought to coll aborate with other University departments in a “Join up your skills” module which derived from close scrutiny of the University’s employability strategy. It seems that successful embedding of IL tuition into curricula is often grounded in strategic policy documents such as these and undertaken collaboratively with stakeholders including career guidance services and academic skills support teams. Through a series of case studies, Mawson investigated the information literacy of graduate students who were now working and found that they sometimes lacked the skills necessary in their workplaces. She suggested that information literacy be broadened beyond academic and research skills to include concepts such as commercial awareness and other attributes which are sought after by employers. I was particularly interested in how online platforms could be leveraged to support new students – so I attended Erica Swain’s presentation Measuring progress using a ‘before and after’ evaluation of online compared with face-to-face library induction. 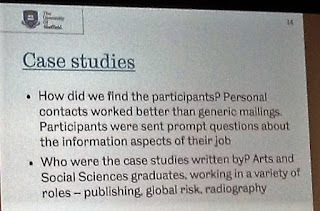 The project team at Cardiff University (which included librarians and a data analyst) gave a group of 1st year dentistry students either online or face-to-face library orientation and conducted pre and post tests measuring their attitudes towards, and knowledge of, the library. They found that the face-to-face group had a slight advantage over the online group, and Erica discussed the implications, while also pointing out the limitations of the study. The final keynote of the day was given by Sarah Taylor from the University of Bolton and explored what usage statistics of the web-scale discovery tool Summon could tell us about patterns in how research is conducted by the average student. She argued for the broadening of the term ‘researcher’ to include anyone systematically investigating any topic and (echoing some of the other speakers) emphasised that effective information literacy instruction should go beyond academia and prepare students for other information challenges they may face in work and in life. There was much agreement that libraries need to be part of the solution instead of accidentally becoming part of the problem by providing (but not curating) multiple information resources and multiple pathways to accessing these resources. The day was neatly tied together by Steve Rose (Deputy Director of Library & Learning Resources at BCU) proposing that we need to base academic library strategies in institutional strategies and link information literacy to improvements in employability, graduate attributes, and learning outcomes for students. He suggested that we pay close attention to ways we can collaborate with our alumni, academics, teaching and learning departments, research development officers and other colleagues to both improve and demonstrate our unique value and impact. 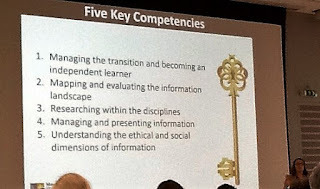 My own key take-aways from the conference were that students are strategic learners and therefore information literacy education must be timely, useful, and flexible in delivery format, and that the evaluation of library services and teaching is as important as the design and delivery stages. See my Storify of the Conference here and download the slides here.